[Shenzhen, China, May 27, 2015] HUAWEI today announced that it has been named one of BrandZ’s ‘Top 100 Global Brands’ for 2015, ranking 70 on the list. 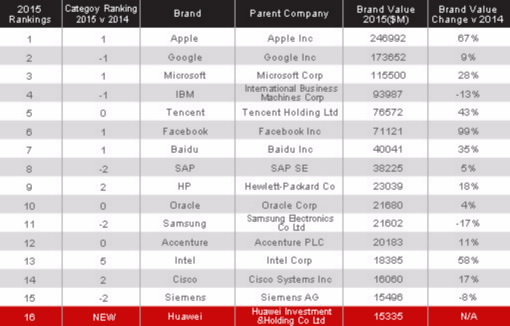 Marking HUAWEI’s debut on the BrandZ list, the achievement follows HUAWEI’s ranking on Interbrand’s ‘Top 100 Best Global Brands’ list last year. The BrandZ ‘Top 100 Global Brands’ list is developed by Millward Brown Optimor, a leading global research agency that operates under the world’s largest communications services group, WPP. As one of the most authoritative evaluations of brand influence, the ranking system used for the BrandZ list is the only one which is based on both brand value on the views of both potential and existing brand consumers and financial data. HUAWEI follows a globalization strategy that integrates the best resources around the world to serve the global market. Today, it offers a full set of global innovation capabilities and systems. HUAWEI operates in over 170 countries and regions, with two third of its revenue coming from markets outside of China. HUAWEI has an R&D presence around the world and invests at least 10% of its annual sales revenue in R&D. It has established 16 research centers in Sweden, Russia, the United States, India, and other countries, and operates 31 joint innovation centers in conjunction with its partners. Proving the success of HUAWEI Consumer BG, HUAWEI ranked as the third largest smartphone manufacturer in 2014 with global shipment reaching 75 million units, marking a 45% year-on-year growth. HUAWEI’s brand awareness has been largely enhanced with the growing global recognition of its flagships smartphones such as HUAWEI P8, HUAWEI Mate7, Honor 6 Plus and Honor 6. According to a research conducted by IPSOS in 32 countries globally, HUAWEI’s brand awareness increased from 52% to 65% in 2014. Representing recognition by two thirds of global consumers. In addition, HUAWEI’s net promoter score surged to 43%, ranking in the top 3 for smartphone brands, demonstrating the improvement in brand experience for consumers and resulting in more device recommendations than before. In 2014, 52% of HUAWEI Consumer BG sales revenue was from overseas markets, the target for 2015 is increased to 60%. HUAWEI Consumer BG is committed to communicating its brand through sport, which is the perfect common language for global citizens. HUAWEI connects with consumers through partnerships with football clubs in more than 50 countries and regions, and local sports activities, such as marathons. HUAWEI has significantly improved the consumer shopping experience through 630 HUAWEI branded shops, approximately 30,000 retail outlets, and a sales team of approximately 10,000 people worldwide.